For the last few months, I’ve reported some extremely positive trends in the Breckenridge real estate market. I’m happy to tell you now that this upward trend is still on track. In fact, Breckenridge’s real estate activity is improving by leaps and bounds. It’s very exciting to see! Sales are up about 15 percent and there are many real estate transactions occurring in the Breckenridge market, even as I post this update. The numbers are phenomenal. Homes under contract are up a fantastic 31 percent over this time last year. Because of this amazing activity, inventory has decreased. At this juncture, it is now down 28 percent. In addition, I expect the amount of available homes will continue to move downward since sales are so high right now. 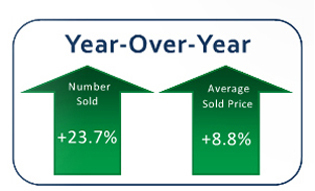 Like the positive gains in our residential sales, the luxury market is garnering great numbers as well. Recent figures show that luxury sales are up 22 percent county-wide. A whopping 80 percent of those sales are located on the south side and 20 percent on the north side. Needless to say, the Breckenridge real estate market is really flourishing right now. That’s why I’m eager to watch how things play out in the months to come. Keep checking back for more updates. I’ll be sure to inform you of the latest news as we head into the fall season. If you’re debating whether or not to buy or sell a home, the most recent market updates are an important resource. I always advise my clients to look for the latest reports on a regular basis so they are always aware of what’s happening in their market. This is an essential step if you’re getting ready to enter the market. Just remember that real estate in Breckenridge can shift quickly. It also tends to move quickly. That’s why you shouldn’t draw conclusions based on a single update. Every market has its own rhythm. For this reason, I strongly urge you to get to know the patterns in your area. Don’t hesitate to contact me if you’d like to understand the Breckenridge real estate market better. I’m always happy to provide you with guidance and recommendations. In addition, if you’d like to view homes that are for sale in Summit County, I’m happy to put together some properties that might suit your needs. Feel free to browse the updated listings on my website as a starting point, and when you’re ready to talk through your options or schedule showings, contact me at any time via email ([email protected]) or on my office line. I look forward to working with you!